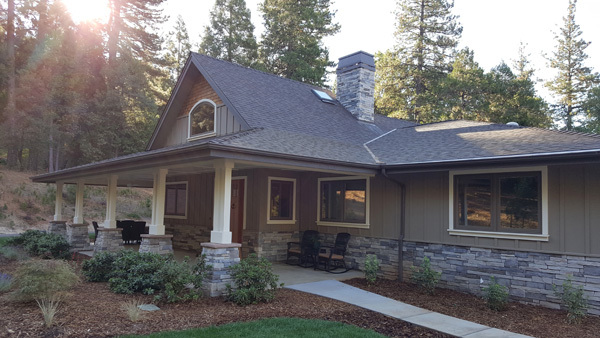 This finely crafted home is an example of what I call “Modern Mountain Craftsman” or “Contemporary Tahoe” style architecture. 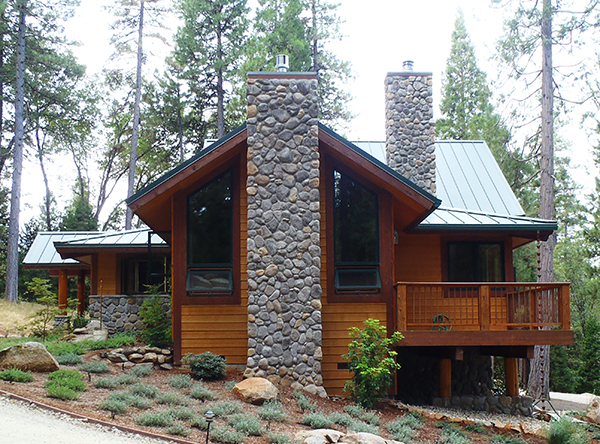 Located in the foothills of the Sierra Nevada Mountains, it is designed to heat and cool itself naturally, and to blend with the forest environment. 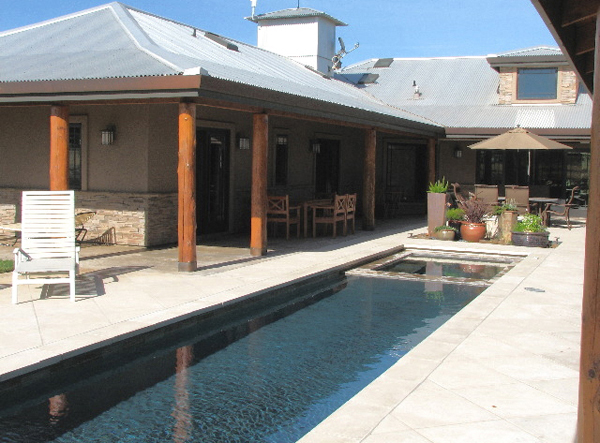 The home consists of three elements; a two bedroom guest house and a one bedroom main house, separated by a large common outdoor deck terrace, with a covered connecting breezeway. 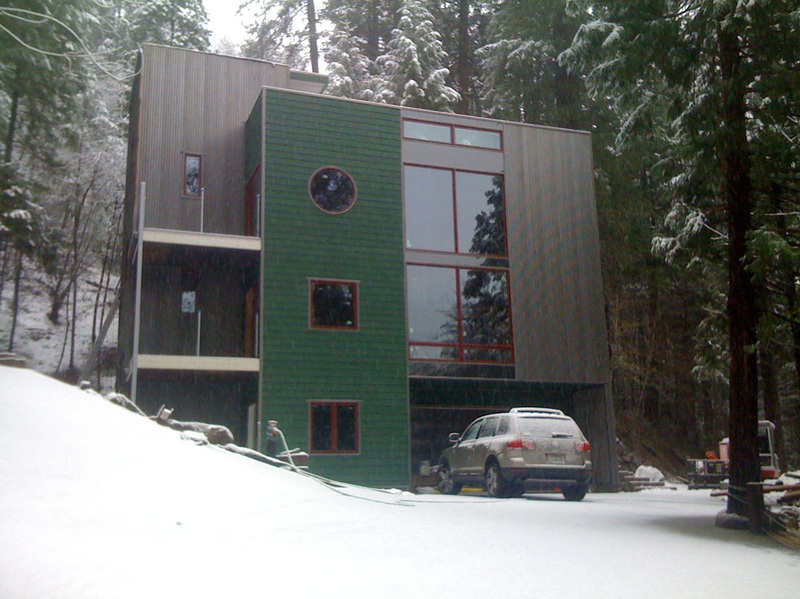 The home is designed with passive solar heating concepts, as are all of my projects, despite the north facing sloping site. The roof and walls are constructed using structural insulated panel (SIP) technology giving an almost airtight weather skin. 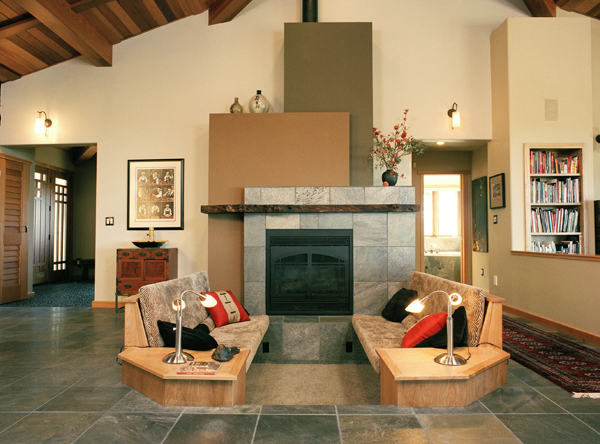 A radiant heated floor throughout provides high efficiency warmth and the interior plaster, rock fireplaces and floor tile add to the thermal mass, which helps with both heating and cooling. 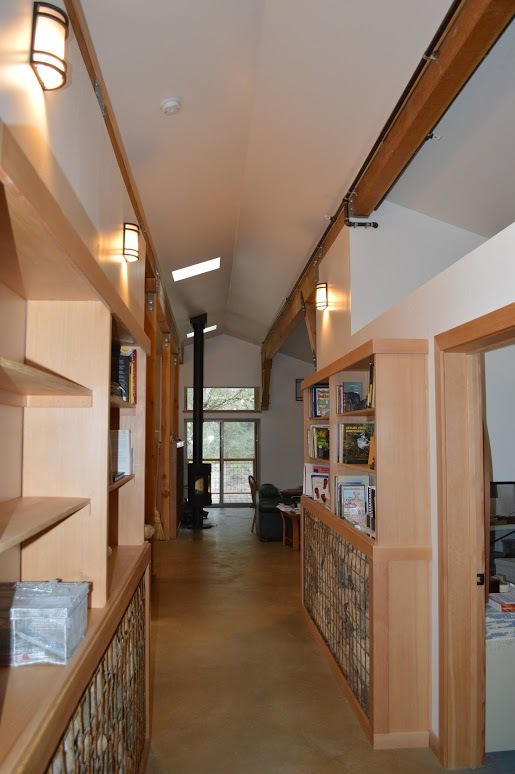 The dramatic north facing great room windows and vaulted ceiling enclose a large gable roof which accommodates a large solar electric array and solar hot water collector on the roof. 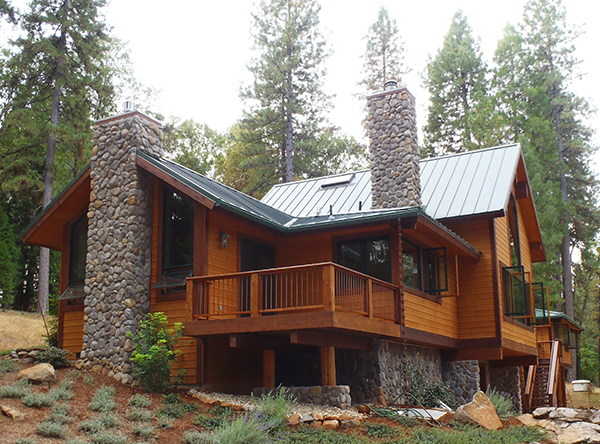 The natural looking exterior is clad with forest green metal roofing, cedar stained cement-fiber lap siding, and field stone veneer. This maintenance free and fire resistant combination of materials and textures create an elegant rustic organic appearance. Inside wood and slate tile floors, plastered walls, stone fireplaces and Douglas fir wood paneled ceilings continue the warm aesthetic. 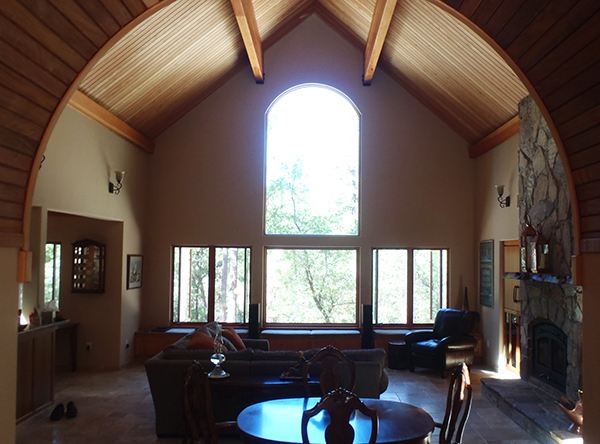 The high vaulted ceiling frames a north view window wall creating a wonderful dynamic indoor-outdoor feeling. This small home exudes comfort, coziness and elegance, because of the palate of rich natural materials, attention to detail, and fine craftsmanship. 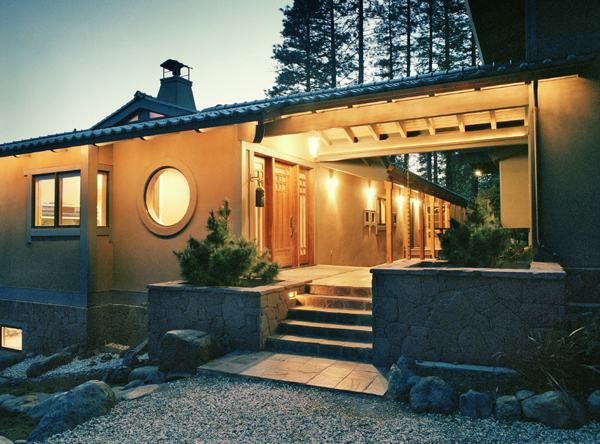 This award winning residence nestled is the Sierra Nevada Foothills of California, is a fusion of modern west coast living and traditional Japanese styling. 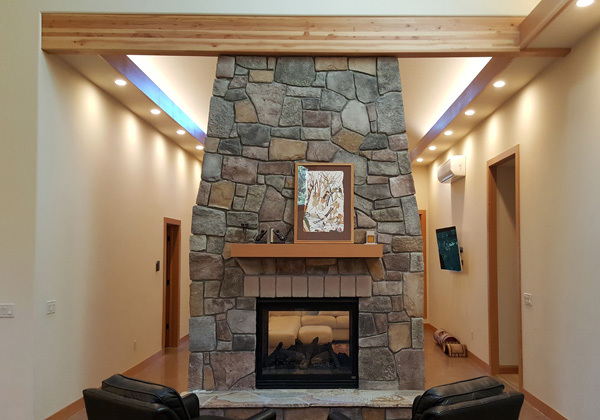 The home is designed for optimum energy efficiency using; passive solar heating and cooling, natural ventilation, daylighting, solar electric panels, solar water preheating, on-demand water heaters, radiant floor heating and gas burning fireplaces. The weather skin system is formed of structural insulated panels, a construction system which echoes the scale of the traditional Japanese tatami module. 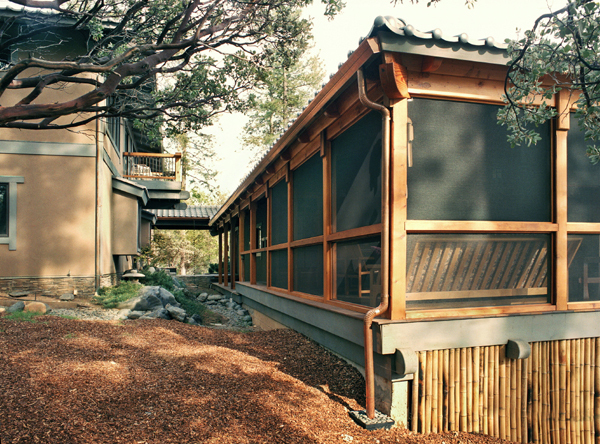 The exterior is clad with authentic Japanese fired clay roofing tiles, hand applied stucco, cedar trim, bamboo accents and copper flashing and gutters. 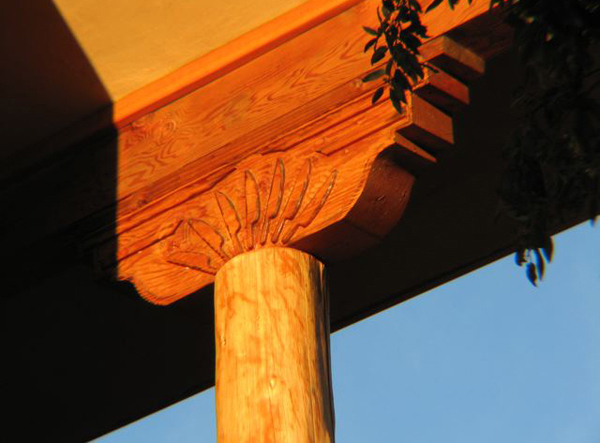 Attention to materials and detail has been applied to create a finely crafted, maintenance-free exterior. 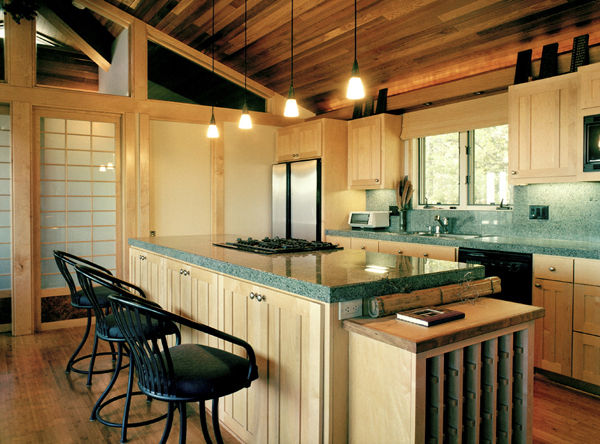 Inside, the combination of western red cedar ceiling, douglas fir trim, red birch cabinets, antiqued granite counters, floors of natural slate and bamboo are carefully composed to create a warm rich comfortable environment. Many hours were spent handcrafting the interior materials seeking the Shibui ideal. This unique home exhibits the elements of modern fine home building with more than a nod to the refinement of traditional Japanese architecture. 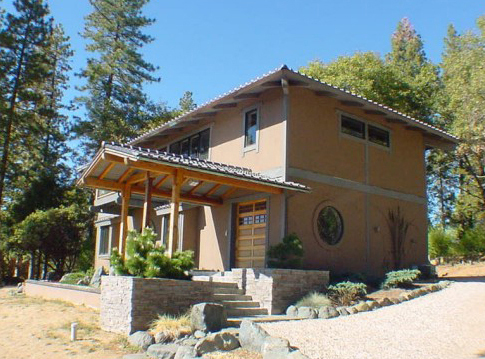 We call it “California Sushi.” The Fenner residence was selected as the overall competition winner of the 2003 National S.I.P.A Building Excellence Award Competition. It is published in the 2008 book Asian Residences for the 21st Century and S.I.P.A. Magazine, Fall 2003. 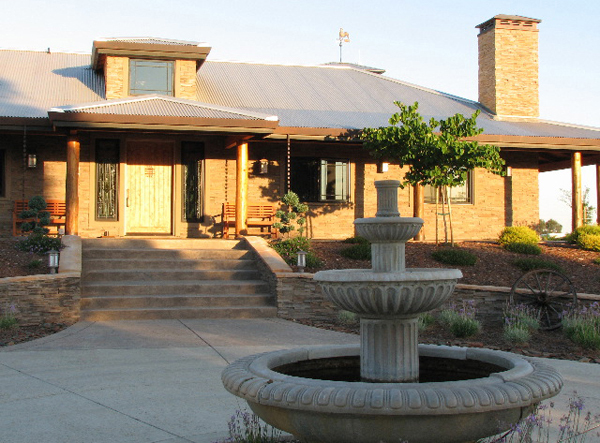 This El Dorado County foothill home is located on a large horse ranch property. 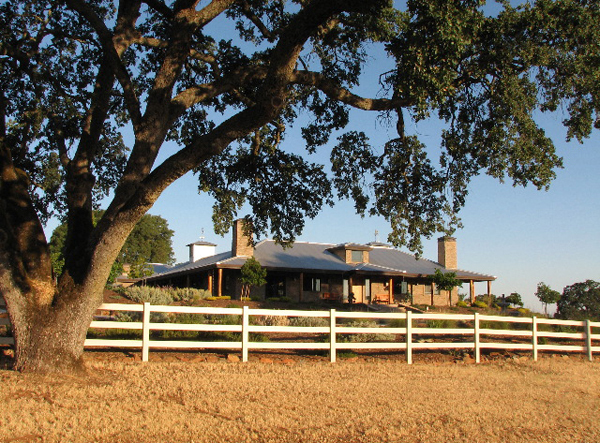 The architectural styling is patterned after the classic “Australian Ranch” style. The exterior of corrugated metal roof, field stone and stucco are durable, fireproof and reflect the Australian pallet of materials. The house is organized around an open interior courtyard with patio, pool and spa. This elegant outdoor entertainment “room” features an ancient oak tree and landscaped area for outside privacy. The guest, living and dining rooms open on to this interior patio creating a nice flow of inside/outside living. 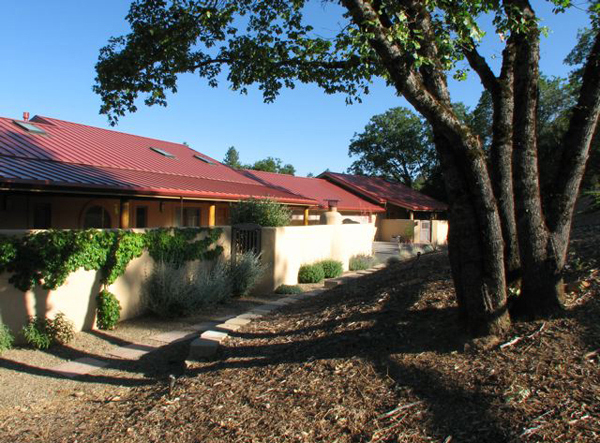 The concrete slab floor and structural insulated panel walls and roof are a perfect weather skin for passive solar heating and cooling. 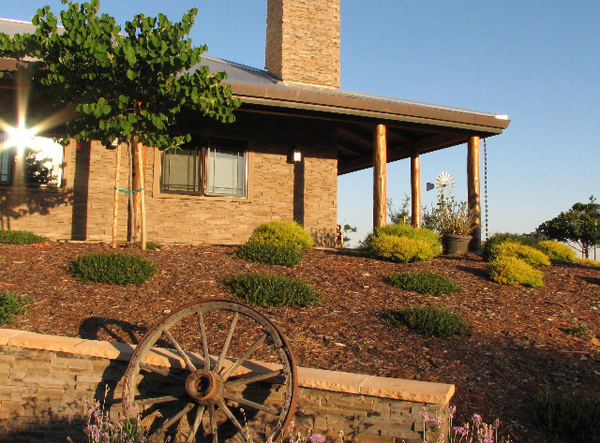 Evaporative cooling towers add to the exterior functional charm elements and compliment the radiant floor heating for year round comfort and economy. 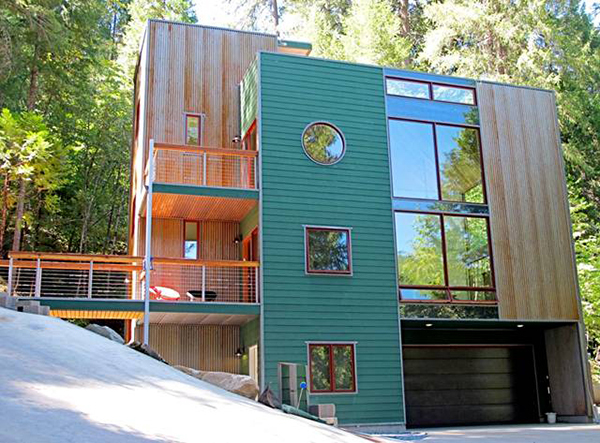 This house incorporates solar electric panels and a rain water capturing system. 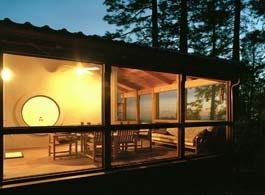 This home illustrates the integration of alternative energy techniques with refined architectural design. 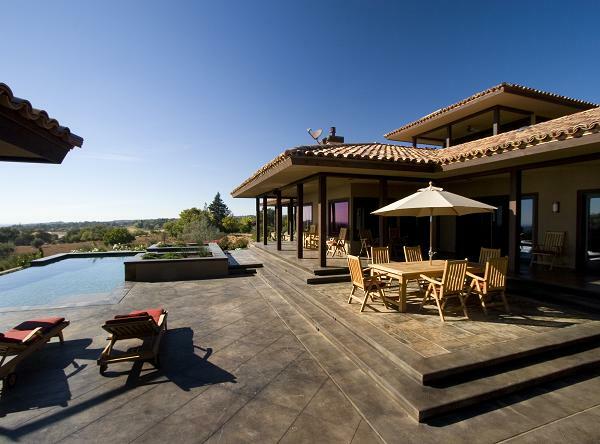 The elegant modern Mission Style home in the foothills overlooking Folsom Lake is a luxurious home for family living and entertaining. 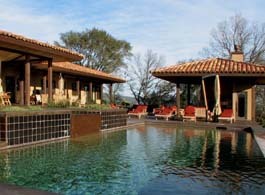 All of the rooms open outward to the view the sunlight, patio, pool, spa and cabana. 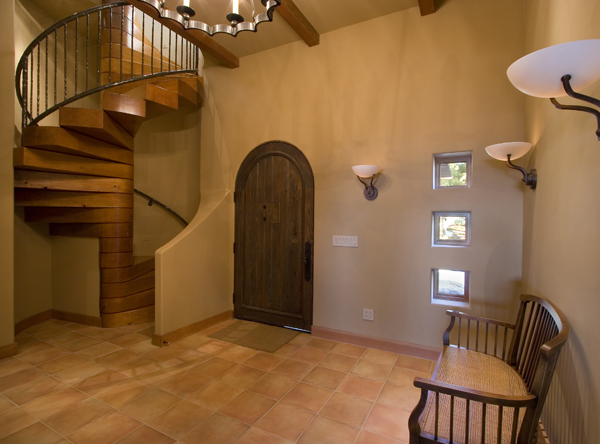 This gracious home is comprised of colors and textures which reflect the adobe and terra cotta tile traditions of California. 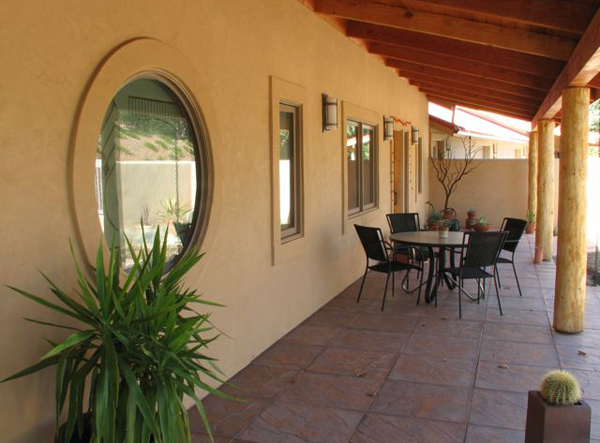 The exterior walls are an earthen color stucco and the interior walls are hand finished plaster with subtle color changes. 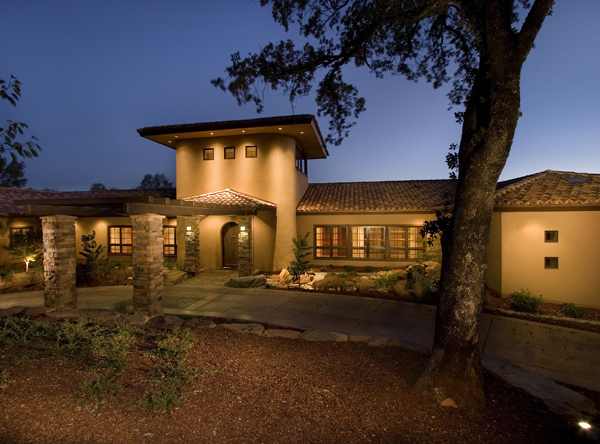 The roof presents a rustic terra cotta tile texture. 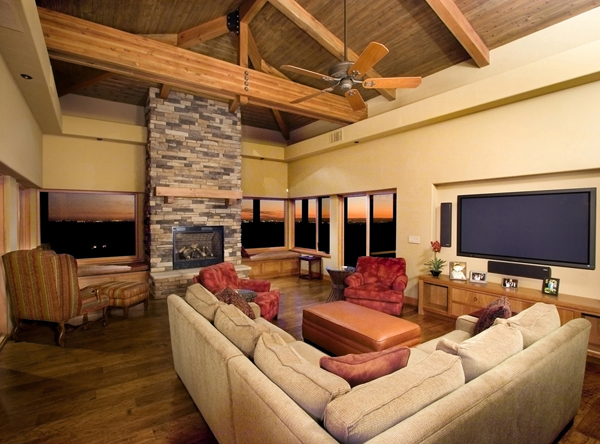 High quality woods and craftsmanship are used throughout. 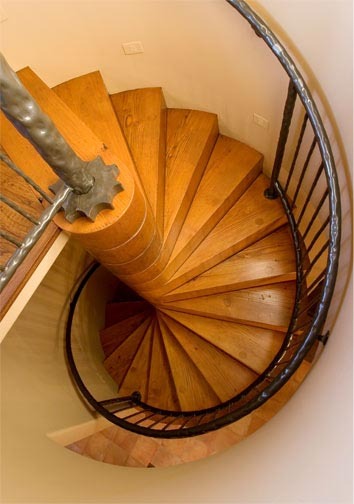 The circular stairway leading to the tower is a custom wooden sculpture with the individual treads cantilevering gracefully out and a steel handrail coiling up the sides. The tower retreat upstairs is a private hideaway. 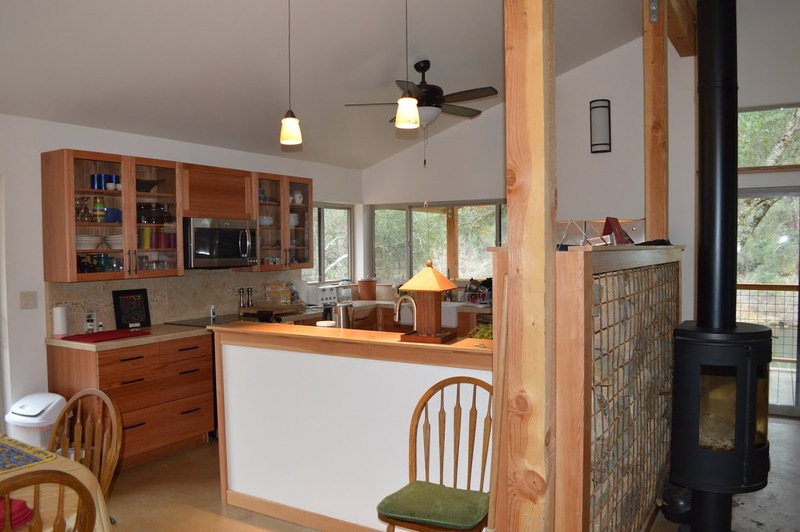 This highly energy efficient home is constructed of structural insulated panel walls and roof with a concrete floor, which incorporate; radiant heating, three separate cooling zones, solar electric and solar hot water systems. 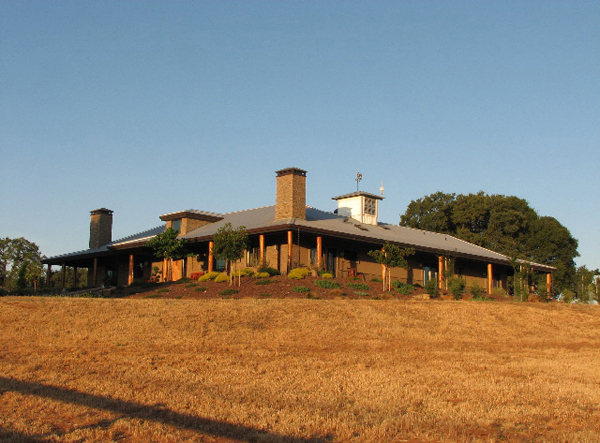 The home takes maximum advantage of passive solar design principles to incorporate natural ventilation, cooling, and daylighting. 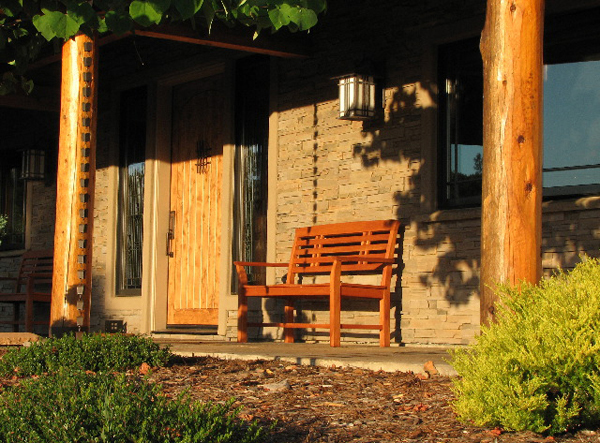 The deep surrounding portal porch allows both ample winter sunlight penetration and extra summer shading. 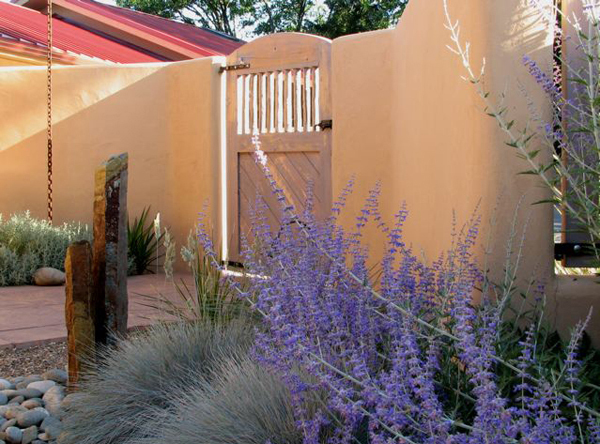 The landscaping is designed using drought resistant native plants. The light fixtures, controls and variable light intensities are designed to save electricity and to achieve maximum function as well as dramatic night illumination. 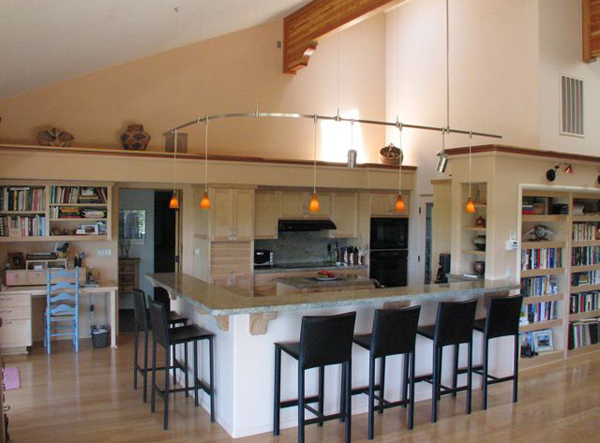 This residence is a fine example of the compatibility of passive solar energy design with sophisticated architecture. 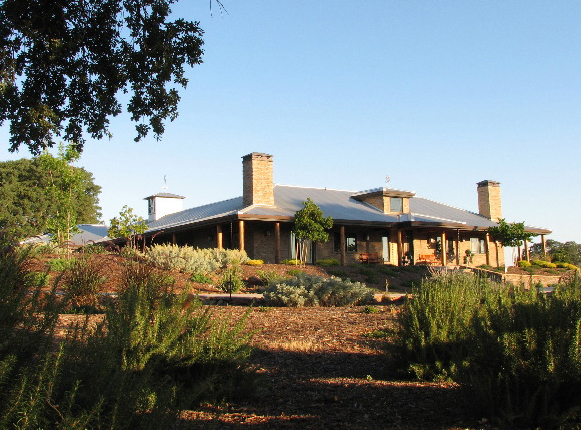 This “New Mexico Adobe” inspired home sits on a pine and oak covered hillside in the Sierra foothills. 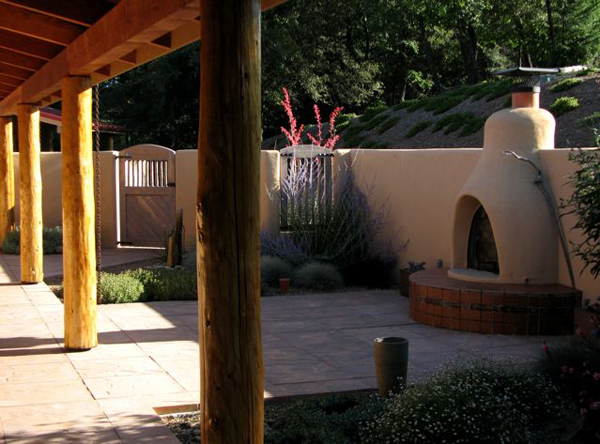 The exterior walled patio/gardens and pueblo fireplace create protected and gracious southwest style outdoor entertainment areas. 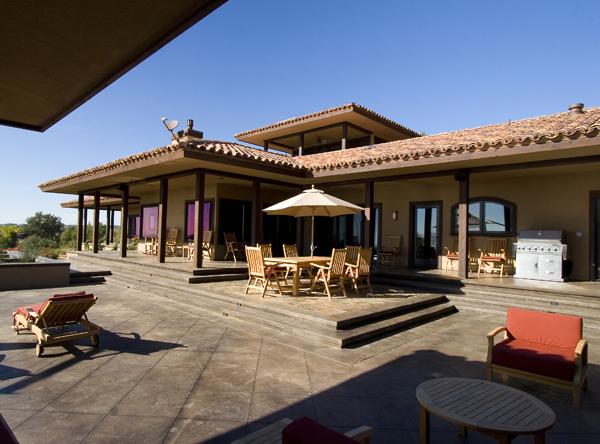 The home has two main zones; family and guest house units, separated by common garages. The bright, open and luxuriously detailed interior spaces include living, dining, library, master suite and artist studio and art gallery. 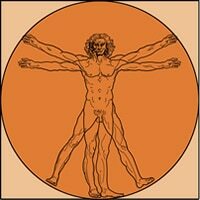 The working artist couple produce graphic art and photography making a joyous and colorful active home. 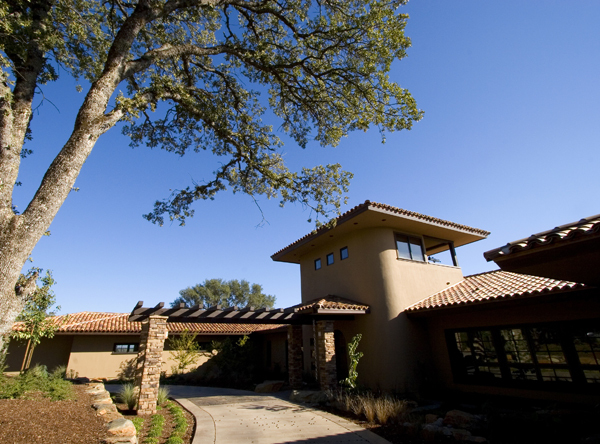 The exterior metal roof and stucco walls echo the tradition of rural mountainous New Mexico styling and protect the home from potential wild fire in this forested setting. 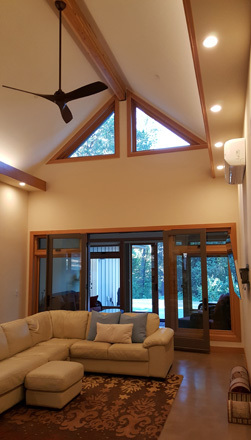 The structure roof and walls are built of structural insulated panels and engineered lumber, while the radiant heated floor and high efficiency air conditioning provide year round comfort in a climate with hot summers and cold winters. 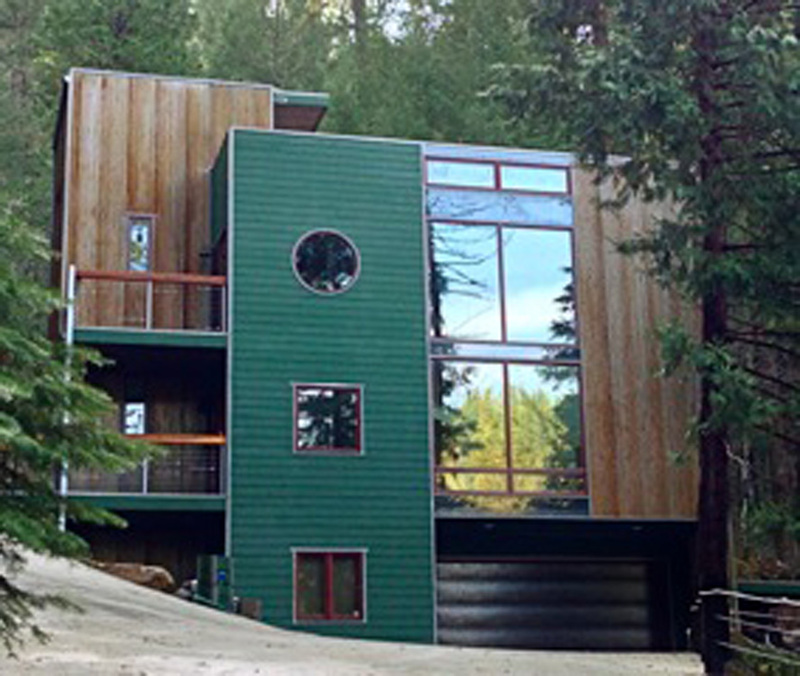 This highly energy efficient home uses passive solar design principles to assist with heating, cooling, natural ventilation and daylighting. 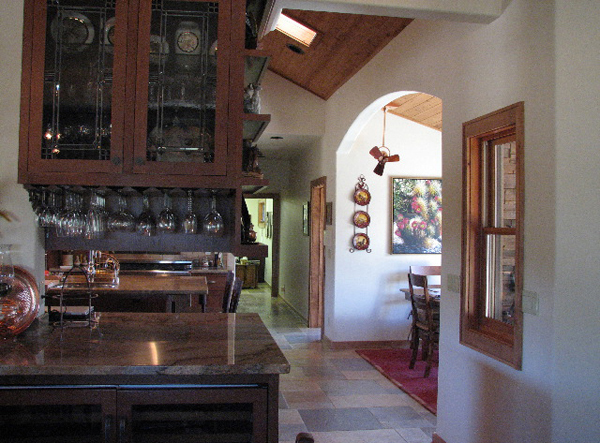 It is a gracious home for all seasons and has been published in the Auburn Journal and Home and Leisure magazine. 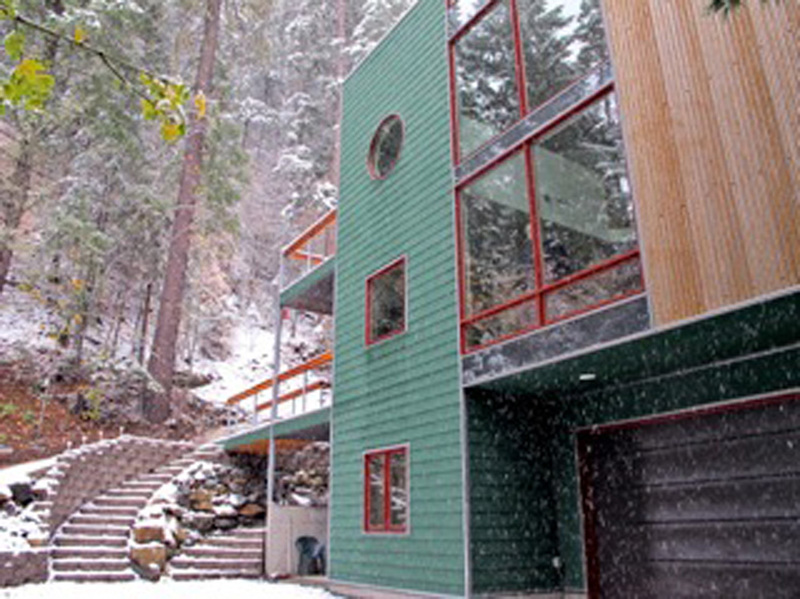 Known as the “TREE HOUSE” this three story modernist home is located on a steep wooded parcel of land fronting the south Fork of the American River in Eldorado County, California. 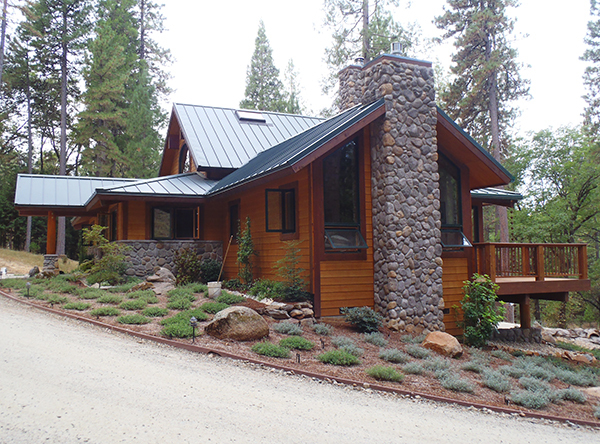 The site is above 5000 feet elevation in snow country of the Sierra Nevada Mountains. The house is nestled into a very tight hillside footprint which required a vertically oriented floor plan scheme. The garage, work, storage and rooms are on the ground floor. 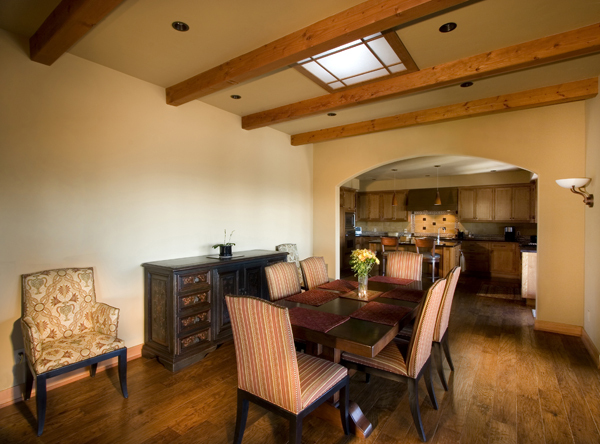 The second floor contains living, dining, kitchen, powder, and guest room with an open two story ceiling above the living area. A dramatic walkway bridge access the main entry door on this level. 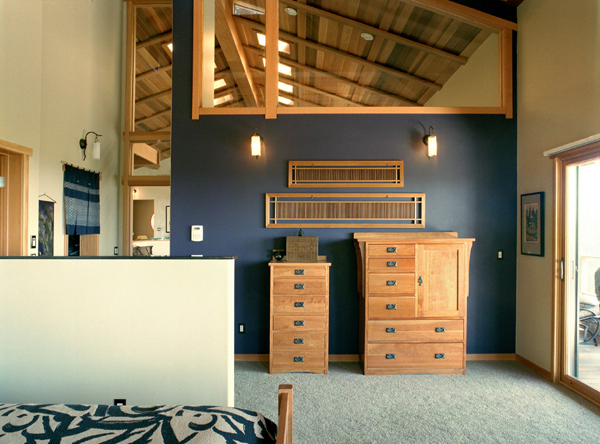 The master suite is on the third floor, along with the study/office which is open overlooking the living area below. The roof level is a roof terrace with stunning views of the surrounding forest and river; this roof terrace is the outside barbecue and entertainment area because of the steep hillside and lack of flat usable outdoor space. A 4 story elevator encircled by a winding stairway is enclosed in a tower element that accesses all levels. 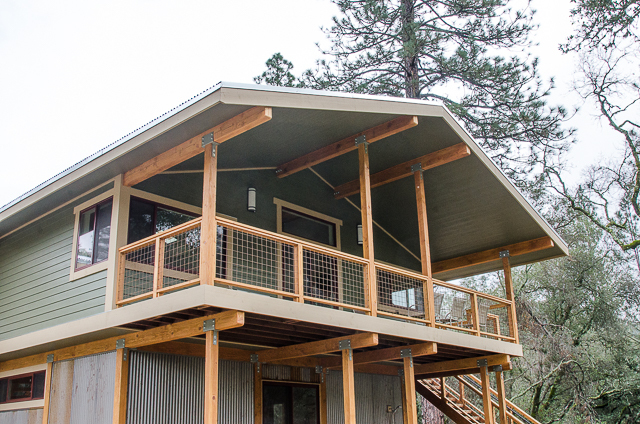 This vertical element is clad with Corten rusting vertical corrugated sheet metal to differentiate it from the habitable floor rooms that are finished on the exterior with green colored horizontal cementious lap siding and glass. The SIP structure provides high strength and energy efficiency and is a classic example of using the structural component modules in a structure designed to optimize their interlocking nature. The roof is clad in concrete pavers making the structure fireproof in this high fire zone. The structural elements are carefully detailed and crafted creating a structure that is distinct and stands out in the natural setting. 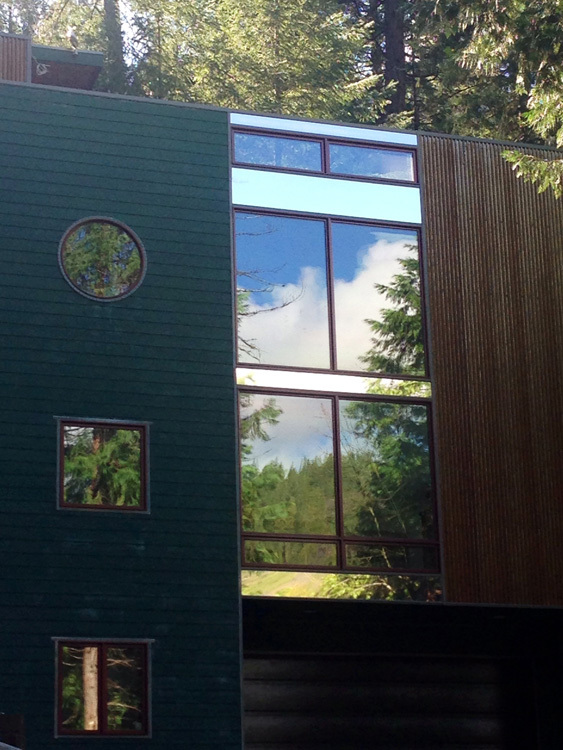 Functionally located the windows reflect the surrounding forest and allow almost panoramic views from the interior spaces. The top level glass railing provides an unobstructed view from the terrace and adds to the reflective quality of the high structure. 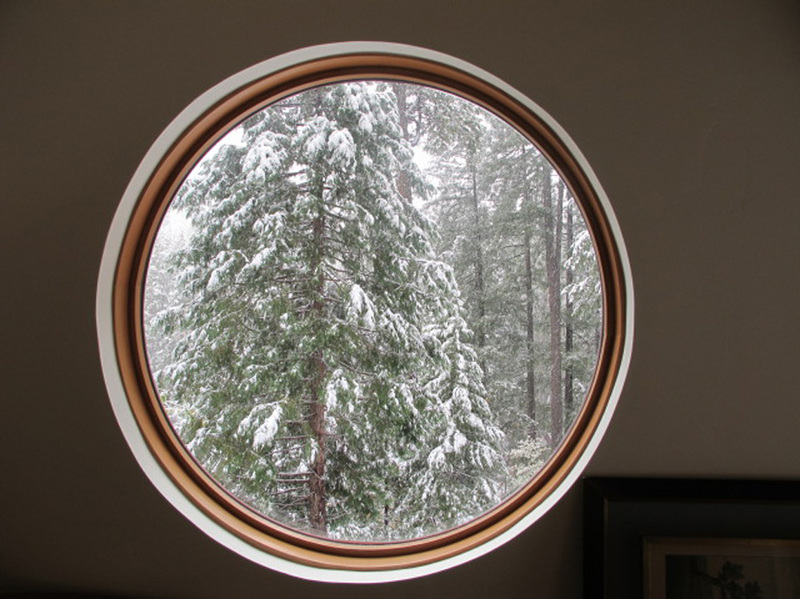 The inside spaces are filled with artwork and are a very comfortable place to view the surroundings particularly when snow falls turning the site into a winter wonderland. 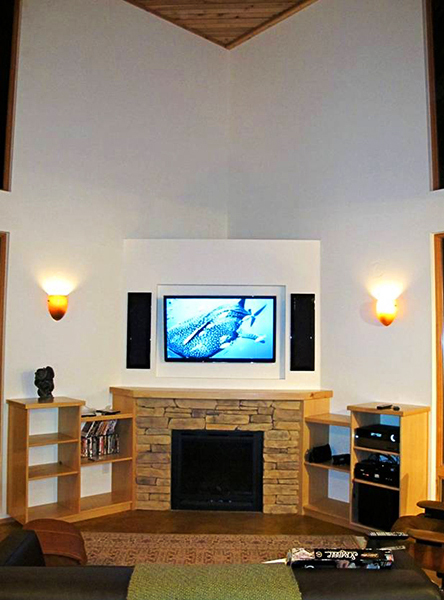 The owners are audiophiles and they have installed a carefully tuned and balanced sophisticated sound system that fills the house with music. This handsome house makes the most of a decidedly difficult building site. 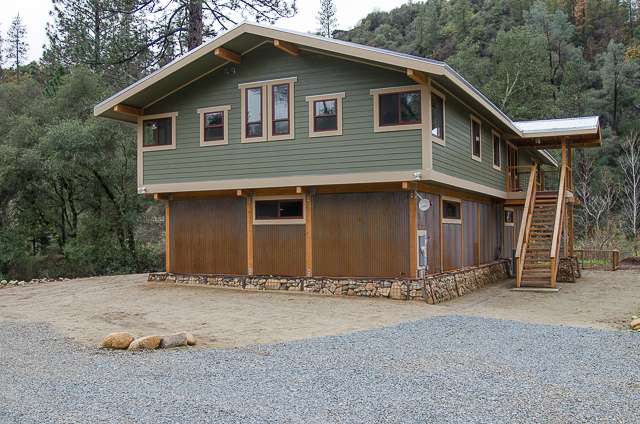 The River House, located on the South Fork of the American River in Coloma, El Dorado County, is designed to be a passive solar Net-Zero residence. The concept is of a house on the second floor level with the lower floor becoming a garage, utility space for storing and repairing kayaks, mud room and stairs. The lower level is a post and beam structure supporting a platform floor above that is cantilevered on all sides, giving the house the appearance of “floating” in the trees. The lower level is clad with corrugated Core-Ten rusting steel which is durable and maintenance free. 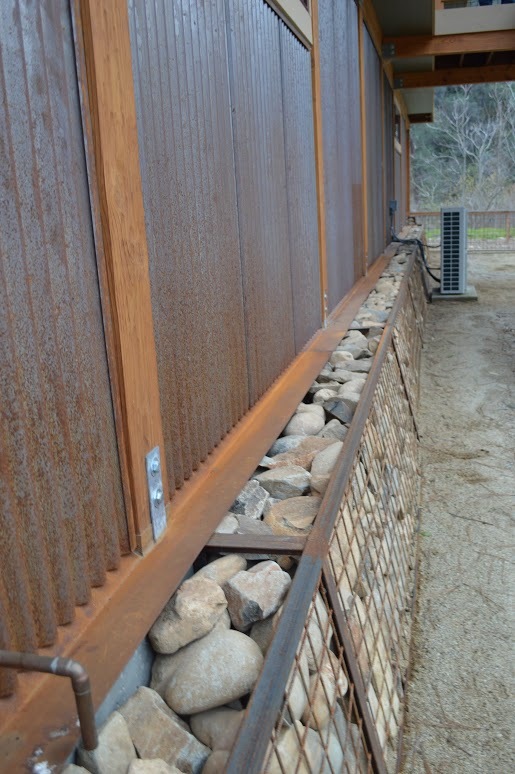 The bottom three feet is wrapped with a wainscot of gabion enclosed river cobble stones from the site to resist staining from flooding and snow. Over time the lower level finish materials will take on deep rustic patinas. 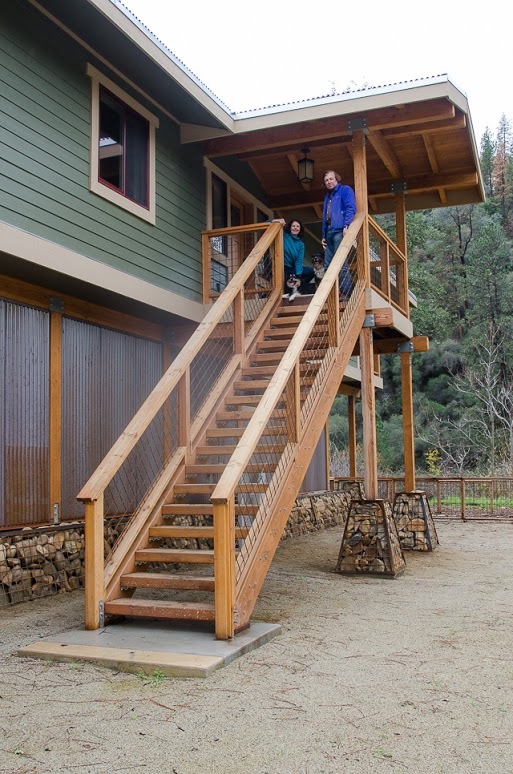 The exterior decks and stairs are constructed of solid timbered Douglas fir lumber for a natural rustic look. 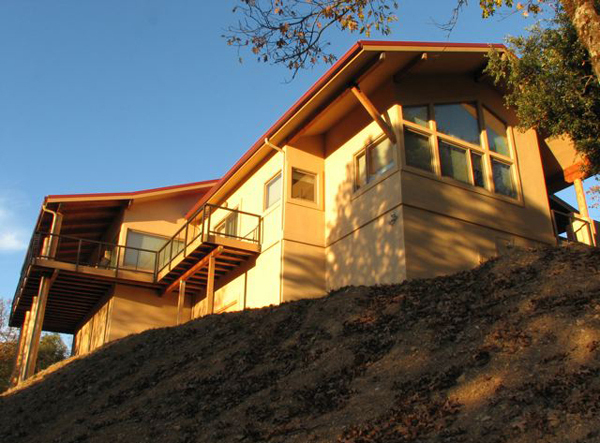 The upper level walls and roof are constructed with Structural Insulated panels (SIPs) giving superior strength and insulation to the living portion of the house. 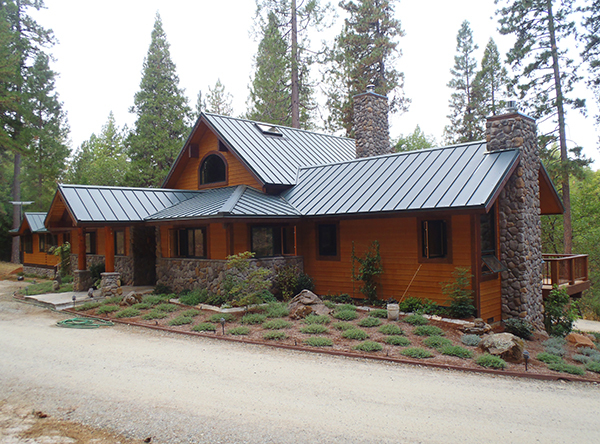 The exterior siding is a fire proof and low maintenance cement composite lap siding stained a moss green; and a standing seam galvanized metal roofing is fireproof and durable. The roof eaves and gables extend outward with exposed beam supports with a Craftsman Style appearance. 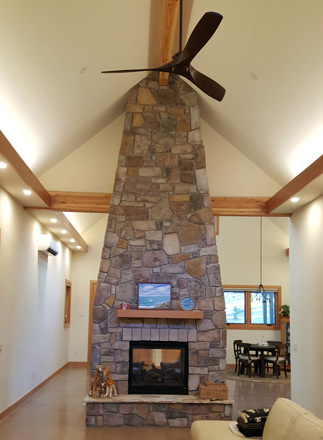 A third level “crow’s nest lookout” provides a whimsical get-away and acts as a natural ventilation chimney The floor plan is laid out with the great room space opening onto an expansive west deck overlooking the river. The ceiling is vaulted in most rooms throughout the house and the eight foot interior walls have interior windows above to share light and ventilation to all spaces. 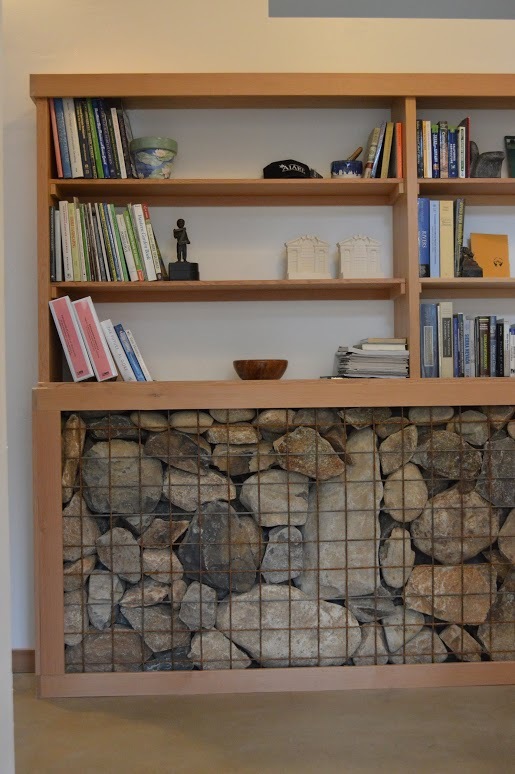 Interior walls of gabion enclosed river rock cobbles provide thermal storage for the interior. The interior is bright and open with fine crafted wood cabinets, doors and flooring creating natural warmth to the interior. The radiant heated floor is connected to a ground-source heat pump system that uses buried tubing for heat exchange which can both heat and cool the house. This heat pump system is designed to be powered by solar electricity. 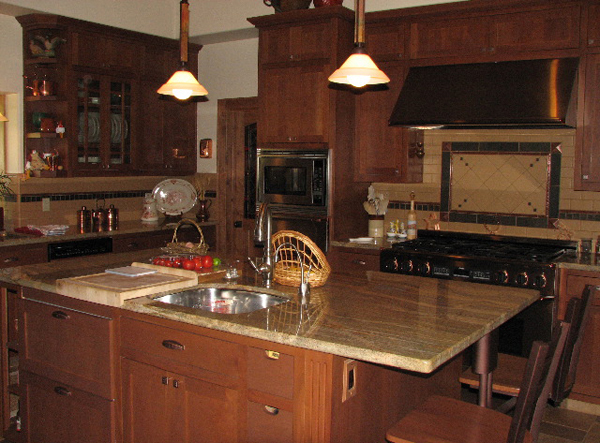 All cooking, heating, lighting and power systems in the house are electrical. 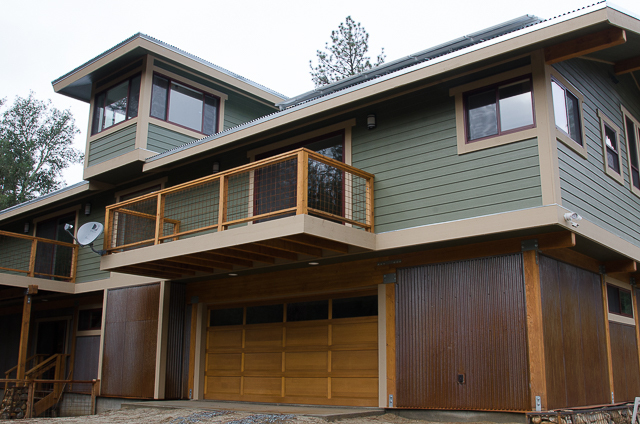 The house is connected to the utility grid for dependable power, but with an optimal amount of solar electric collectors the amount of energy collected from the sun will cancel out the annual cost of electricity. The owners plan extensive natural landscaping to surround the River House to visually “ground” the structure and further the “floating appearance integrating the structure with nature. 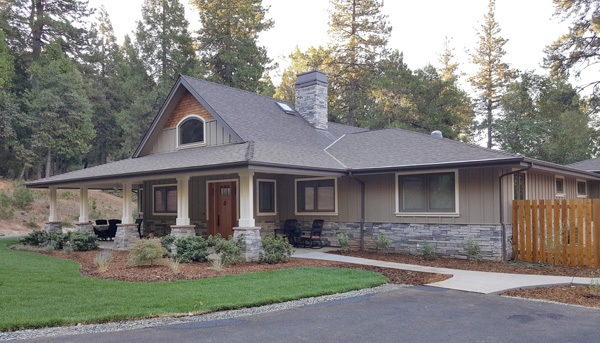 This charming home, located in a Sierra Nevada Mountains Gold Rush town, is reminiscent of cottages popular in the early 1900’s but was constructed in 2015. 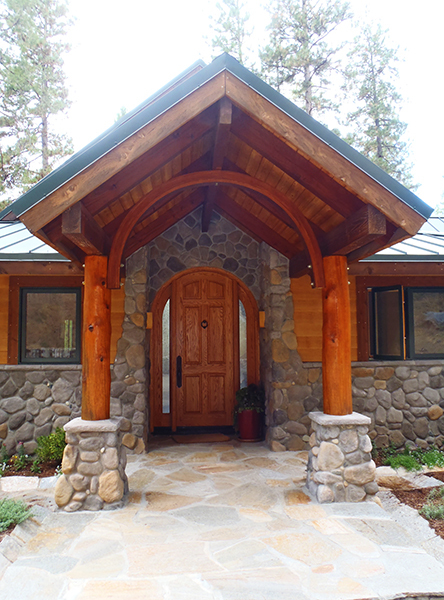 The exterior made using fireproof low maintenance materials including board & batten siding, local stone and standing seam metal roofing, demonstrates a careful balance of timeless traditional elements. We are proud of the combination of textures, shapes and colors creating a gracious, refined and lively appearance. A deep wrap around front porch provides comfortable outdoor living in all seasons. The water conserving natural landscaping, featuring indigenous planting is designed to be deer proof and easy to care for year round. 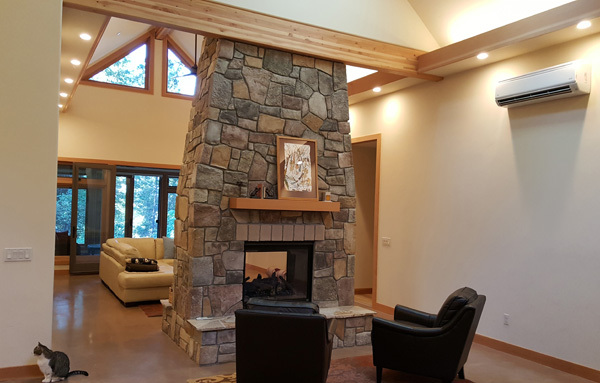 Inside the finishes are more modern; stained concrete floors, Douglas fir trim, Shaker cabinets, stone fireplace, granite counters and European textured plaster finish; lend a simple warm charm. 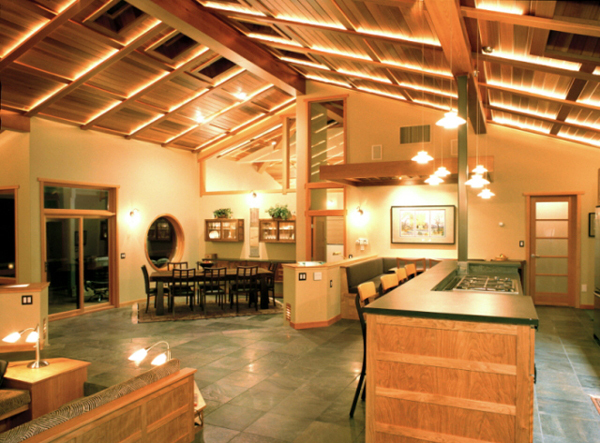 Careful placement of skylights and gable windows provide ample daylight, while efficient fixtures make effective subdued night lighting. The central two sided fireplace separates the living dining area from a family entertainment room that expands into the comfortable sunroom. 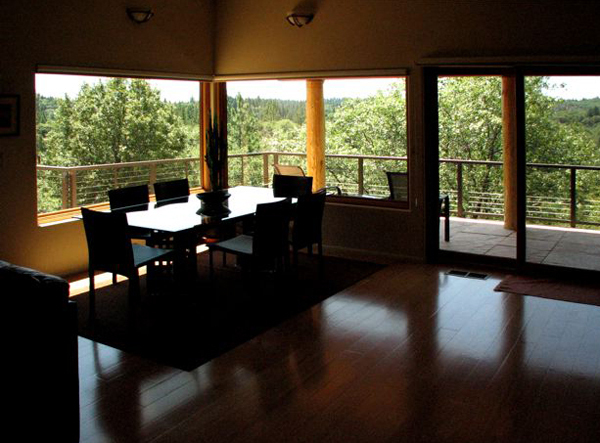 A gracious master bedroom and bath open to the sunny natural forest environment. 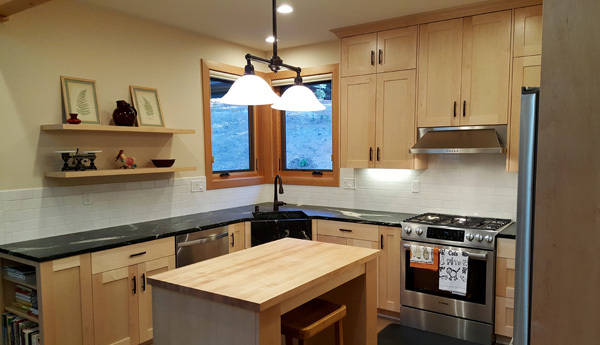 Josh Moore, the General contractor, provided finely detailed craftsman elements throughout the home. A high efficiency heat pump system delivers economical comfort for all zones of the home including the playful “man cave” garage workspace.